Beauty is never complete without healthy and lustrous hair. Here, we bring you some of the best and easy-to-follow home remedies for hair growth using lemon. However, let us first discover what actually impedes natural hair growth. Hair fall and dandruff are the two major culprits for hair thinning. Some other factors are unhealthy lifestyle, stress, improper sleep, chemical-infused hair styling products and shampoos, excessive use of hair dryers and use of certain medications. Different hair products available in the market promise dandruff free and long hair. However, the harsh chemicals infused in them strip off your hair’s natural moisture leaving them dry, frizzy and brittle. Therefore, switching to natural remedies is the safest and economical path for hair growth. Using lemon for hair growth can give your hair the long lost lustre. Read below for further details! Benefits of Lemon for Hair Growth? Lemons are the nature’s wonderful gift with versatile uses and benefits. These amazing citrus fruits are filled with several nutrients including vitamin C, magnesium, calcium and flavonoids making them great for healthy hair, skin and body. Here is why this small size yet incredible fruit can enhance hair growth. Lemons are richest sources of vitamin C that help in making hair stronger and longer. Fresh lemon juice stimulates hair growth besides strengthening the hair follicles. Limonene, a compound found in lemon juice imparts shine to frizzy and dry hair. The anti-fungal property of lemon juice combats dandruff causing fungus and also provides relief from other scalp infection. The acidic property of lemon gently cleans away accumulated dust, dead cells and other unwanted deposits from scalp and hair. Besides encouraging healthy hair growth, the refreshing smell of lemon leaves hair smelling sweet and good. How To Use Lemon For Hair Growth? Cut a ripe fresh juicy lemon into two pieces. Directly squeeze fresh lemon juice from the lemon wedge on scalp and hair. Massage scalp using the squeezed lemon wedge for around 5 to 10 minutes. Allow the juice to stand on hair for 10 more minutes. Follow the remedy once a week. Shampoo washes away dust, oil and other dirt from hair and scalp. But any traces of leftover shampoo after rinsing hair can damage hair follicles. Lemon juice rinse fully cleans hair to ensure no traces of shampoo are left behind. Grow your hair faster by blending lemon oil with castor oil and olive oil. The essential fats and vitamins in olive oil nourishes hair from the root to shaft whereas castor oil helps to develop longer, thicker and stronger hair. In a clean bowl mix 1 tbsp luke warm olive oil with ½ tbsp warm castor oil. Add 3 drops pure essential lemon oil to the bowl and mix well. When the oil is comfortable warm apply it on scalp and hair. Massage well for 5 to 10 minutes and leave the oil overnight. Next morning follow the lemon juice hair therapy to remove excess oil from hair and finally wash hair with a mild herbal shampoo. Repeat the remedy at least once a week. Note: This oil blend is suitable for dry, frizzy to normal hair. The antifungal property of these three oils makes a strong anti-dandruff blend. The cooling effect of camphor provides relief from itchy scalp. Mix 2 tbsp warm coconut oil with 2 drops lemon and camphor oil each. Massage hair and scalp for 5 to 10 minutes with the oil and leave it overnight. The next morning wrap hair with a towel soaked in warm water for around 10 minutes. Unwrap towel and wash hair with a mild shampoo. The natural nutrients and minerals in fresh coconut water nourish hair. Mix ¼ cup fresh coconut water with 1 tbsp lemon juice. Apply the liquid on scalp and massage for 5 minutes. Rinse hair with clean water. Repeat the remedy once a week. You can also mix one fresh coconut water with half lemon juice and use it as a last rinse on hair after your shampoo. The anti-microbial, moisturizing and restoring property of aloe vera cleans scalp, locks in natural hair moisture and accelerates hair growth. Mix 2 tbsp fresh aloe vera gel from a broken aloe leaf or pure packaged aloe vera gel with 1 tbsp fresh lemon juice. Massage scalp for 5 minutes with the succulent portion of broken aloe leaf. Let the mixture stand on hair for 20 to 30 minutes before washing off. Alternatively you can replace aloe vera gel with 3 tbsp aloe vera juice. This pack works as a natural hair conditioner and hair color as well. Henna pack keeps the scalp clean and protects against any scalp infection. To ½ cup natural henna powder add fresh juice of 1 lemon and enough plan yogurt. Mix the ingredients to make a thick hair pack. Apply the pack on hair and wrap a plastic cover around hair. Leave the pack for at least 30 minutes. If you are interested to color your hair then leave the pack for 1 to 2 hours. Wash hair with clean water and follow up with a mild shampoo. Note: For best results use the hair pack after oil massage. Note: The hair pack is recommended during summer as henna naturally cools the scalp. This protein rich and deep moisturizing hair mask works to make thicker and stronger. Beat 1 egg with 1 tbsp olive oil and half lemon juice. Apply the mask on hair and scalp. Allow the mask to dry before washing with clean water. This incredible mixture cleans scalp, moisturizes scalp and accelerates hair growth. Curry leaves are a great remedy for thick gorgeous hair. Add two fistful of fresh curry leaves, 1 tbsp coconut oil and half lemon juice in a blender to blend well. Apply the paste on scalp and hair. Leave the pack for around 15 to 20 minutes and rinse hair with clean water. Lemon juice gives best result when used in moderation. Due to its acidic nature, excessive use on hair can actually leave your hair follicles brittle. Avoid using lemon juice on scalp with open wounds and cuts to prevent irritation. The bleaching property of lemon tends to lighten hair. Hence if you concerned to maintain dark hair then do not leave the lemon mixture on hair for more than 10 minutes or avoid lemon remedy for hair. The above remedies with lemon ensure best noticeable result when followed as per mentioned procedure with precaution. The remedies in conjunction with a well balanced diet, adequate sleep and exercise all contribute to full nourishment of hair and body. Try any remedy mentioned above in the article regularly. Apart from that, eat nutritional food which are rich in omega fatty acids, vitamins and biotin. Wash your hair 3 times in a week to remove the accumulated dust, dirt and dead skin cells. Reduce stress levels by doing meditation or yoga. You can try any process mentioned in this article http://homeremediesforlife.com/dandruff/ to treat dandruff and strengthen the hair growth. lemon juice coconut oil mixture used to massage my hair daily and i leave it overnight on my head.this is good or not nd there is any problem? Lemon juice contains bleaching properties so it may lighten your hair. If you are worried about the lightening then you can wash after 10 minutes, if not you can leave overnight. Thanks for tips.It really works. Use the above mentioned methods and apart from that wash your hair twice a week, massage warm oil on scalp regularly, include fresh fruits and veggies in your daily diet and drink lots of water. You can do any of it as per your convenience. Try 3, 4 or 8 method mentioned in the above article. I have great problem with hairfall.My hair volume became very less.Can you suggest which oil and shampoo should I choose. Use pure cold compresses coconut oil, sweet almond oil or virgin olive oil as per your convenience. Use shampoos that contain tea tree oil. Avoid using shampoos that contain paraben chemical. Yes, you can. Apart from that it is very important to eat a nutrition balanced diet, control the thyroid levels and wash your hair regularly. I did the lemon juice and olive oil is it okay that I didn’t mix the egg with it? nd can I use coconut oil with lemon juice on my hairs overnight??? I lost my hairs in front n mid kind of baldness if i follow ur above procedure so can i get back my hairs? ?it will grow again ? Yes, lemon juice helps in strengthening the hair and encourages the growth of new hair. Apart from trying lemon juice remedies, it is also important to consume nutritional diet and drink plenty of water to flush out the toxins. Iam 27 years male From 8 months I am loosing excess hair and getting bald from middle . I can see that iam getting bald. Please tell me what to do and regrow my hair naturally. You can try any method mentioned above in the article. Apart from you have to eat a nutritional diet to prevent hair loss from inside. Include vitamin A, K and minerals rich food in your daily diet. Drink plenty of water to flush out toxins and do hot oil massage at least twice in a month. I applied aleo vera with lemon. How can effect daily using lemon juice?any problem daily use? The acidic properties of lemon can lighten the hair and make them dry and frizzy with daily use. So it is better to avoid daily application of lemon juice. Hello, kya coloured hair mai lemon use kar sakte hai? The acidic properties of lemon can lighten or remove the colour from the coloured hair. So you can avoid lemon and use different remedies. You can find more remedies in this article – http://homeremediesforlife.com/hair-growth/. I’ve done it 3x, after an hour washed my hair, my goodness there’s too much hair fall, why? i only applied lemon juice. can i leave it overnight? If your scalp is irritated or allergic to lemon, then it can cause hair fall. If you think lemon is the reason for your hair fall then discontinue using it. In order to control your hair fall, apart from following the natural remedies, you have to eat a nutritional diet which includes vitamin C, A and B rich foods and drink plenty of water to flush out toxins. Try any remedies mentioned above in the article. Apart from that, consume nutritional diet, drink plenty of water and include vitamin C, A and K, omega fatty acids and biotin rich foods in your daily diet. 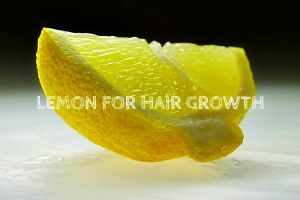 If lemon didn’t work for you then you can try other ingredients mentioned in this article -http://homeremediesforlife.com/hair-growth/. Apart from that, eat nutrition rich food, include foods that are rich in vitamin C, biotin, zinc, keratin and iron, drink plenty of water to keep the scalp hydrated and reduce stress levels by meditating. And they get damaged and so much rough and frizzy . And all this led to hairfall . My lots of hair are falling direct from the roots day by day and also they are breaking from inbetween . Then i surf on net that how to treat them naturally . And i heard about the miracle effects of curry leaves . I am using curry leaves and coconut oil combination from last 13 days . I use it with a gap of one day . But still i am having hairfall . Can you pls tell me when its result will be visible ? Pls guide me on this . To strengthen the hair follicles you have to eat nutrition rich food. Include foods rich in biotin, omega fatty acids, vitamins A, B, and C, iron and potassium. Drink plenty of water to keep the scalp hydrated. This prevents or treats scalp infections. Can I add castor oil and egg along with lemon juice and how much time can I keep that mask? Yes, you can. You leave the application for 30 minutes. Beat 2 eggs and add 4 tablespoons of olive oil into it. Mix well and apply the mixture on the hair. Comb your hair with a wide-toothed comb. Wear a shower cap and leave it on for 30 – 45 minutes. Rinse with mild shampoo and pat dry. Avoid rubbing the towel vigorously to dry the hair as it will make the hair frizzy. But remember that trying out natural or other treatments regularly can damage the natural hair texture. This can eventually lead to hair loss or breakage. Hi ma’am I have oily hair and it have too dandruff also. what I should do for it please suggest me. and I want to grow it. I spent 1 hour, then lemon juice placed on the head. Any side effect on my hair. This I did once Only. Lemon juice may slightly lighten your hair. As you have applied it only for once, then it should not have caused any change. It is difficult to mention the exact time as everyone is different. So try the method regularly with some patience until you get the results. I am suffering from hair fall as horse shoe hair fall for years how will it take to me to get my hair back using lemon juice only in the day? Please give some advice! May you tell me the right time to use it? You can try 1, 3, or 5th method mentioned in the above article. From the above article, follow 3rd or 7th remedy as per your convenience and try it regularly. Apart from that nutritional rich food helps to strengthen the hair follicles from the inside. Include foods rich like vitamin C, A and K, biotin, iron and potassium in daily food. Avoid using chemical based shampoos and other hair products. Avoid hair styling products for few months to help you hair recover from the damage. Improving the hair growth helps to get long and healthy hair growth. Try any method mentioned above in the article. Apart from that consume nutritional food, reduce stress levels and drink plenty of water. I have hair fall problem and lot of wet dandruff on my scalp,i don’t know hair fall is due to dandruff or any other reason,everyday i gets itching and irritating scalp.My dandruff is completely wet which can be seen in oily scalp,I want to use lemon juice along with some ayurvedic medicine and post that i don’t want to wash my hairs with Shampoo becuz i can not use shampoo as iam using ayurvedic medicine(according to seller). Please suggest me if i do not use shampoo post applying lemon juice will negatively affect on hairs? If you leave the lemon application without shampooing, it can attract the dust and worsen the problem. Moreover, it can lighten the skin color as well. You have to repeat this process once in a week. Yes, you can. By stimulating hair follicles and nourishing the scalp, you can improve the hair growth. Try any process mentioned above as per the instructions specified. If you have sensitive skin, then you can try any other ingredient mentioned in this article – http://homeremediesforlife.com/hair-growth/. Apart from that, do a hot oil massage 3 times in a week, eat nutrient rich food, reduce stress levels and drink plenty of water to keep the scalp hydrated. can i use lemon juice with herbal shampoo??? As both are natural solutions, you can use lemon with herbal shampoo without any side effects. If lemon is used daily, then its bleaching properties can lighten your hair. So, it is better to use it once or twice in a week. You can try khadi or biotique herbal products. Does straight lemon juice cleanse your hair follicles and how often do I have to use the pure lemon juice please. Yes, straight lemon juice cleanses the hair follicles and strengthens it. You can apply lemon juice once in a week. Can u suggest a way in which my hair doesnt seem to be oily and can reduce hair fall has well.?? Lemon is helpful in controlling the oil production and improve the hair growth. So, try any method mentioned above in the article. Apart from that, eat food rich in vitamin C, biotin, magnesium, and phosphorous. Do hot oil massage once or twice in a week. Reduce stress levels and drink plenty of water. can i use directly lemon juice on my scalp for hair fall problem. Yes, it is ok to apply lemon juice directly on the scalp. But if you have sensitive scalp, then avoid direct application, dilute it with some water before application. Hello I’m facing itchy head skin problem so, and its occurring hair fall so please tell me what can i do for that please help me and reply me as soon as possible…. You can follow the remedies mentioned in this article – http://homeremediesforlife.com/itchy-scalp/. Apart from that, perform hot oil massage 2 times in a week, drink plenty of water and eat nutritional food. i have itchy head skin problem and it is occurring hair fall so please suggest me what would i do for my hair fall problem please reply me as soon as possible ….Thank You. You can try any method mentioned in this article – http://homeremediesforlife.com/itchy-scalp/. Apart from that, drink plenty of water to keep the scalp hydrated, eat vitamin C, K, biotin and magnesium rich foods. Perform hot oil massage 2 times in a week. Can I leave d mixture of coconut oil and lemon juice overnight?I want long hair…wat to do? Yes, you can leave it overnight. todAy i slept for a night with lemon juice on my hair is it wrong for one night ? It’s ok. However avoid doing it in the future as it can slightly lighten your hair. And also said in TIPS day u shudnt leave lemon on hair more than 10 minutes as it lightens d hair. So isn’t it cause any problem? May be it evaporates soon ryt???? As the lemon juice will be diluted in water, it will not have negative effects on the hair if left. So, you can try the remedy without any worries. You can treat the hair fall problem from inside. For that you have to eat nutritional food, reduce stress levels, exercise regularly and drink plenty of water. You can try any one of the above mentioned remedies as per your convenience. Apart from that perform hot oil massage at least twice in a week. Eat nutritious food, reduce stress levels and drink plenty of water. my mid side of my scalp seems to be getting bald and hair is lighten, what should i squeeze lemon directly n massage my scalp for 5 to 10 min or should i mix with aloe vera with lemon and massage onto my scalp for 5- 10 mins please advice appreciate it . You can try lemon and aloe vera combination for reducing hair loss and improving hair growth. I am facing problem of premature grey hair. Can I use mixture of lemon and coconut oil? If yes how long shuld i leave that mixture for ?